Capturing daily or staged situations using all kinds of audiovisual equipment, formerly reserved for professionals, is available for a growing group of people, who moreover have the possibilities to share this content worldwide instantly . The explosive growth of online video sites creates a vast, easily accessible audiovisual archive which more and more reflects our “state of being". These archives are expanding organic systems, in which the human collective knowledge, interests and fascinations are bundled and stored. Interactive systems that are a magnet for users and therefore automatically update and expand themselves day and night. They lay bare a deep human division:The desire to belong and the desire to distinguish oneself. The revolutionary availability of so much material and the possibility to search this archive by using keywords form the basis of the spatial audio-visual installation ‘Unleashed Content’. 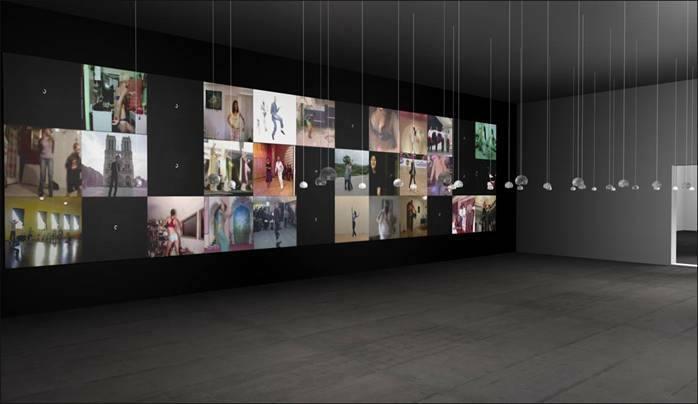 The work is composed out of hundreds of film clips, which are collected by entering keywords in online video sites. Most search engines not only provide immediate results, but at the same time offer content-related alternatives. Thus the searcher comes from one thing to the other in an infinite series of unexpected topics. Thirty-six video’s of each of these topics have been collected, and are brought together within the work. The criteria for this compilation have a musical and visual compositional origin. The result is a, in every detail composed, ordering of parts to a whole. All video’s are projected on a long wall in various arrangements. Every image has its own audio-channel which is performed by a little loudspeaker hanging free in space. All 36 loudspeakers are hanging 2 meters above the floor, pointing straight down (see floor map). The public can make different choices in the way they perceive the work. Standing directly underneath óne of the speakers offers the possibility to concentrate on the belonging image at the wall. When many movies are shown simultaneously the area under the speakers has the atmosphere of a busy street, where people on foot can catch snatches of conversations. ‘Unleashed Content’ tries to put the online video-material in a new perspective, and make it tangible as an almost natural universe. Abundance and profusion play a key role. Because of the multitude of simultaneously shown related content, even the most unexpected and unknown filmic subject can lose it’s unique character. Discovering a hidden, obscure film can be attractive and exiting because of the supposed unique character of it. Once only, and just because of that, special. Internet, with increasingly sophisticated search machines, opens up these hidden places and thus more or less weakens or demystifies the former unparalleled experience. The mystery, the surprise at the discovery of the unknown, shifts to wonder about the fact that the unknown is not unique, that it exists in such large numbers. Being confronted with massive individuality, formerly invisible threads that connect us show up. Within ‘Unleashed Content’, one the one hand there is room to concentrate on one single film, which is then temporary shown in a wall-filling format. On the other hand, the film will regularly disappear in an enormous amount of similar material in which it is embedded. On one long wall three projectors show a total of 36 films.